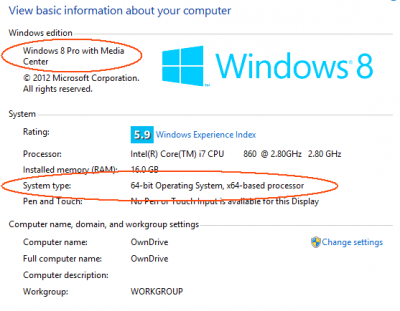 Andy Rathbone » What version of Windows do I have, and is it 32-bit or 64-bit? What version of Windows do I have, and is it 32-bit or 64-bit? Q: I’m trying to install a program, but I don’t know if my computer has a 32-bit or 64-bit version of Windows. I don’t even know what version of Windows I have. PC technicians usually repair my PC, and I don’t know what version came with my computer. How can I find out if my PC meets the requirements for this program? A: Many of today’s programs want to know not only what version of Windows lives on your PC, but whether it’s 32-bit or 64-bit. Luckily, these arcane details can be found fairly easily. 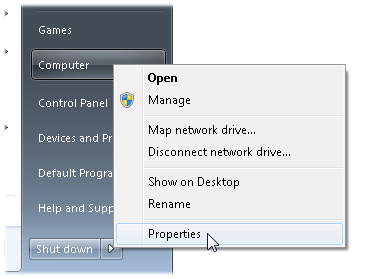 Right-click the menu item named “Computer” or “My Computer” (shown above) and choose Properties from the pop-up menu. When the System Properties window appears, read the information to discover your version of Windows, and whether it’s 32-or 64-bit. 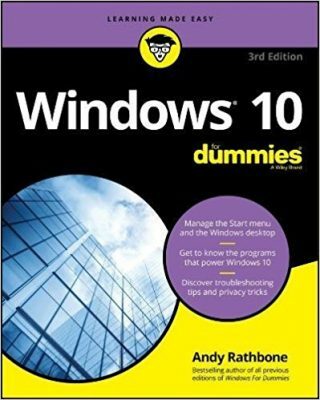 If you don’t see a Start menu button in Step 1, then you’re running Windows 8, so jump to the Windows 8 section at the end of this article. Following those steps in Windows XP brings up a window like the one above. First, find the window’s System section (circled in red). There, you see that this computer runs Windows XP Professional. It’s actually Windows XP Professional Version 2002, a special version which lets you run temperamental Windows XP programs within Windows 7. The other main Windows XP version is Windows XP Home. It’s also running Service Pack 3. 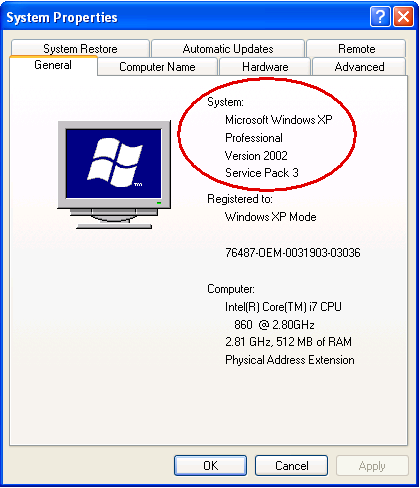 (Every version of Windows XP should be running Service Pack 3, which brings it up-to-date with security fixes.) Service Packs arrive through Windows Update. Finally, nearly every version of Windows XP is a 32-bit version. But if this version was one of the few that ran 64-bit, the window above would mention that. Following those steps in Windows Vista brings up a window like the one above. First, find the window’s Windows Edition section (top, circled in red). There, you see that this particular computer runs Windows Vista Ultimate. Other popular versions include Starter, Home Basic, Home Premium, and Business. Unlike Windows XP, Windows Vista came widely distributed in both 32- and 64-bit versions. To see your version, look in the System’s section’s System Type area (bottom, circled in red). The example above is a 32-bit version of Windows Vista. Following those steps in Windows 7 fetches a window like the one above. First, find the window’s Windows Edition section (top, circled in red). There, you see that this computer runs Windows 7 Ultimate. 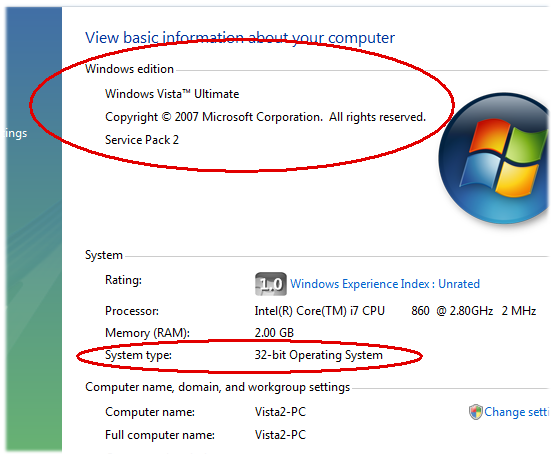 Like Windows Vista, Windows 7 came distributed in both 32- and 64-bit versions. To see your version, look in the System’s section’s System Type area (bottom, circled in red). 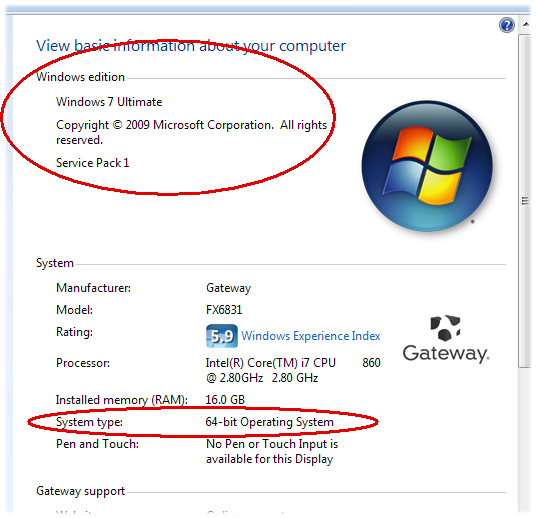 The example above is a 64-bit version of Windows 7. From the Start screen, open the Desktop tile. From the desktop, fetch the Charms bar and choose Settings. From the Settings pane, choose PC Info, and the screen below appears. In the Windows Edition section at the top, you can see this version is Windows 8 Pro with Media Center. 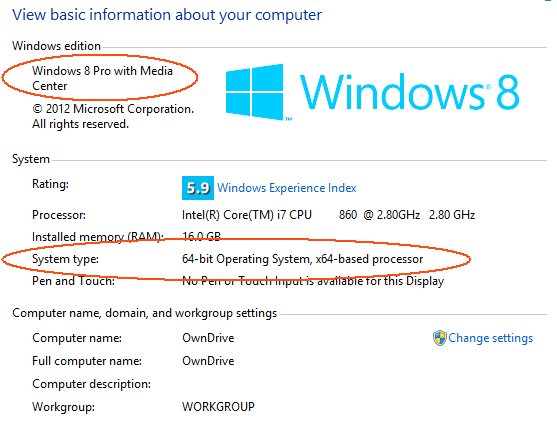 (Other common versions are Windows 8 Home and Windows 8 Pro.) To see whether your version of Windows 8 is 32-bit or 64-bit, look in the System section under System Type. In the figure above, you can see that this is the 64-bit version. Posted: August 8th, 2011 under Windows 7, Windows 8, Windows Vista, Windows XP. Just want to thank you for making it so easy to find out if I have a 32bit or 64bit.Every freaken place I looked for answers kept on saying R click my computer and then click properties and it will show me,BUT Nobody says anything about Xp professional 2002 serv pack 3,are 32bit and will show only when its a 64bit..Thanks.I appreciate someone who explain everything in detail,so computer dummies like myself can also learn!! This also answered my question about whether I had 32 or 64 bit windows Xp installed using Windows XP Professional. Thank you for your great explanation.